A number of years ago, Ed Appel, who had been a member of the Kenneth Burke Society for many years, asked a reasonable question: What do I get for my membership dues? That question haunted me for three years when I served as Treasurer of the Kenneth Burke Society. It haunted me because, frankly, the answer was: Not much. We offered a very good newsletter, though it came out only occasionally. For those attending the Triennial Conferences of the Kenneth Burke Society, often there was a conference fee discount for members. About the only good news I could offer was that the dues were low: $20 per year or $50 for three years (and half that for students). We can now add that one of the benefits of membership is support of KB Journal. Obviously, though, this is not a benefit limited to members of KBS. We made a decision when we launched the journal in 2004 that it would remain freely available to anyone who happens upon our website. It just makes sense to share research on Burke with as wide a community as possible. With this issue, however, the benefits of membership have just gone up significantly. We are happy to announce a new feature of KB Journal that offers premium content exclusively to members of the Kenneth Burke Society. While the bulk of the journal, including archived issues, will remain freely available to everyone, anyone wishing to access this premium content will need to create a (free) account at KB Journal site and then purchase a membership in the Society. The Treasurer will adjust your account so that it gives you access to the new premium content. So, what do you get for your dues now? Your membership connects you to valuable resources for Burke scholars. First and foremost, KBS underwrote the most significant upgrade of our bibliography of works about Kenneth Burke since Bill Rueckert’s bibliography in Critical Responses to Kenneth Burke, 1924-1966. The number of those sources has almost doubled, from about 800 to over 1500. These include, for the first time, dissertations and theses about Burke, as well as hundreds of abstracts on both old and new sources. The new “Works about Kenneth Burke” not only has more sources, it also comes in a number of useful forms, including arrangements by author, title, and date; subsets of the whole bibliography that focus on dissertations and theses, books, journal articles, and book reviews; and a full bibliography that includes abstracts. I discuss and draw upon this bibliography extensively in my essay in this issue, “Burke by the Numbers.” See Premium Bibliographies (KBS members only!). A second premium content in the new members’ area can quickly offset the cost of your membership: We have arranged KBS member discounts on books from a variety of publishers of books by Burke and those who study him (KBS members only!). These include the venerable University of California Press, Parlor Press, Roman & Littlefield, and Say Press. 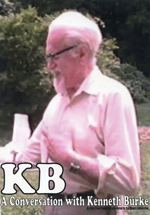 Finally, we have included PDF archives of the Kenneth Burke Society Newsletter. If you would like access to these valuable resources, please use the easy, online Paypal system now available to join (or rejoin) the Society. The dues you pay to KBS will be used to continually update the bibliography and to develop new premium content, as well as to support the activities of the Society, including its triennial conference. By the fall we hope to add a new bibliography of dissertations and theses listed by keyword, university, and director. We also will seek to expand the number of sources that include abstracts. Are you happy now, Ed? I thought so. Find out about Harry Chapin's video interview of Kenneth Burke and how you can get a copy. Join and Pay Online << new!